Logging to a database in a LabVIEW application has its uses, however sending test results as an email can also be very useful. Sending an email to a Google (gmail) account is relatively simple using .NET constructors. By using the various constructors, an email can be sent using an existing gmail account. (Click here to get a gmail account.) The email can be sent to a recipient, carbon copied to a recipient and even have an attachment added. By using the VI as part of an application, any string can be written and sent as an email. I used this VI to email results for an automated test so that I could monitor its progress after each test was completed. Logging to a database is also very effective but sometimes it’s easier to access an email account over accessing a results database. To download the example VI, use this link. There are times in a LabVIEW program that where you need to reinitialise all the front panel indicators and controls to their respective default values. I like to do this as the first step before the VI is run so that I know that everything is in a default state. 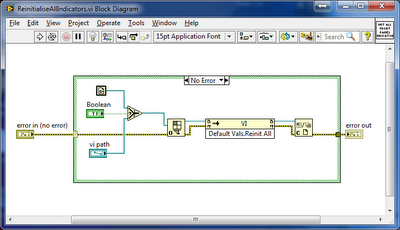 This can be done by using a property node for each indicator or control. With large programs this can become very tedious and add a significant amount of unwanted clutter. There is another, easy way to accomplish this and that is to use a reference to the current vi and an invoke node. By adding this VI at the start of your program, all the indicators and controls are initialised to their default values.